Promote healthy hair, nail and skin. Packed with the essentials to help promote healthy hair, nail and skin. 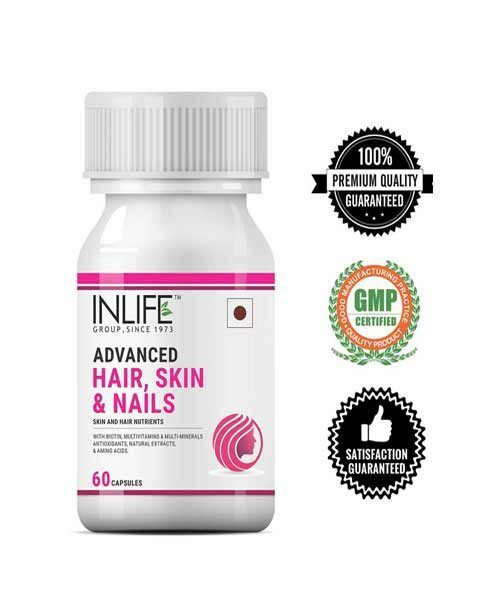 With Biotin, Grape Seed Extract, L-Cysteine, DL-Methionine, Citrus Bioflavonoids & natural extracts of Bhringraja, Amalaki Dry & Brahmi with essential vitamins & minerals, it’s easy to see that INLIFE Advanced Hair, Skin and Nails Vitamins are for you. 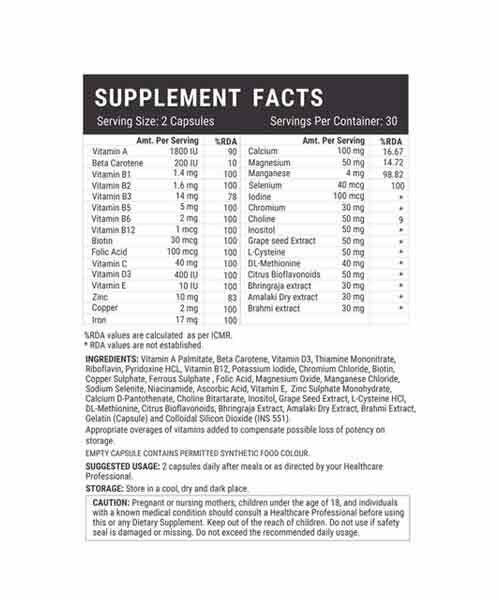 INGREDIENTS: Vitamin A palmitate, Beta Carotene,Thiamine Mononitrate, Vitamin D3, Riboflavin,Pyridoxine Hcl,Vitamin B12,Potassium Iodide,Chromium Chloride,Biotin,Copper Sulphate,Ferrous Sulphate, Folic Acid ,Magnesium Oxide,, Manganese chloride,Sodium Selenite,Niacinamide,Ascorbic Acid,Vitamin E,Zinc Sulphate Monohydrate,Calcium D-Pantothenate, Choline Bitartarate, Inositol, Grape seed Extract, L-Cysteine Hcl, DL-Methionine,Citrus Bioflavonoids, Bhringraja Extract, Amalaki Dry Extract, Gelatin (Capsule) and colloidal Silicon Dioxide. Low levels of biotin can lead to brittle nails, dull-looking skin and thinning hair. That’s why vitamin B7 is found in many cosmetics and health products for the hair and skin. When taken as a health supplement, biotin helps you maintain your hair and nails healthy and strong! It is a vital part of a healthy metabolism; it’s used to metabolize fats, carbohydrates and amino acids and turn them into energy. It helps make sure your body has all the energy it needs! Working to restore balance within cells, our proprietary formula effectively stave off aging. It’s full of antioxidants, Vitamins C & E, our supplement aids in enhancing collagen production and formation, which, in turn, provides elasticity, as well as a youthful appearance to your skin! It also helps fight free radical damage to your skin. Our product contains the most effective formulation of trusted ingredients that are carefully processed and manufactured in our state-of-the-art manufacturing facility, so you can be sure that you’re safe. 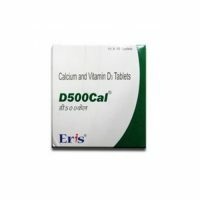 As a dietary supplement, take two (2) capsules together once a day after breakfast with a full glass of water, or as directed by your healthcare professional. For those with a more sensitive constitution, we recommend taking one (1) capsule twice per after meal with a full glass of water. DIRECTIONS TO USE : Instruction : Two capsules daily or As directed by the Healthcare Professional . Caution: Vitamin A palmitate, Beta Carotene,Thiamine Mononitrate, Vitamin D3, Riboflavin,Pyridoxine Hcl,Vitamin B12,Potassium Iodide,Chromium Chloride,Biotin,Copper Sulphate,Ferrous Sulphate, Folic Acid ,Magnesium Oxide,, Manganese chloride,Sodium Selenite,Niacinamide,Ascorbic Acid,Vitamin E,Zinc Sulphate Monohydrate,Calcium D-Pantothenate, Choline Bitartarate, Inositol, Grape seed Extract, L-Cysteine Hcl,DL-Methionine,Citrus Bioflavonoids, Bhringraja Extract, Amalaki Dry Extract, Gelatin (Capsule) and colloidal Silicon Dioxide.